Why should your business use custom table covers & skirts at events? There simply is no better way to get your company noticed than by using printed emblems on throws or linens at promotional gatherings, like trade shows or conventions. The custom table covers & skirts, such as printed tablecloths and runners, can have eye-catching text with many color choices or even full color graphics to stop passersby in their tracks. The vivid cloths displays are ideal for use in an exhibit booth or at various functions where you want people to remember the name of your business and how professional advertising drapes looked on tabletops. 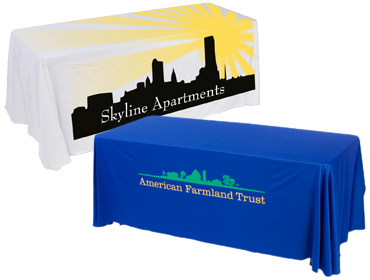 The tablecloths & runners with logos come in several sizes and styles, like stretch and free-flowing, so that all businesses have the ability to afford promotional advertising on fabric. 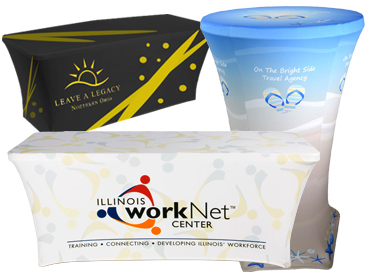 The custom table covers & skirts for cocktail or rectangular tabletops are typically seen in trade show booths or at job fairs, but really any company, like restaurants, bars, churches or schools, can use the throws to increase their customer traffic or personal presence in the community. 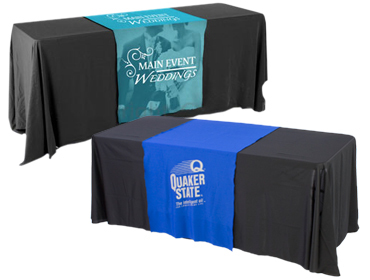 These affordable printed tablecloths & runners are durable and perfect for a vendor or busy organization that needs to use them over and over at the many events they attend. There are complete sets available as well that include cocktail or rectangular dining furniture with a stretch or free-flowing graphic and possible header sign. What are the options provided with the printed tablecloths & runners? 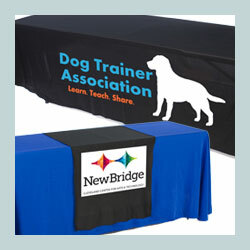 These custom table covers & skirts with logos come in black, white, blue and red to fit 6’ or 8’ rectangles on 3 or 4 sides. Text and graphics can be imprinted in 1, 2, 3, or full color. The runners are 30” or 60” wide fabric drapes that are available in the standard colors of black, white, blue, and red. These coverings are designed to work on both 6’ and 8’ tabletops. Full Color graphics or images in 1, 2, or 3 colors are possible. The covers & skirts with logos that we sell in sets with rectangles or cocktail highboys are allow customers to have everything that they need to set up a booth. The stretch or loose coverings all feature personalized text or graphics and the choice of a table header. The table headers are designed to fit on standard 6’ or 8’ trade show booth rectangles and allow for two different images to be imprinted on them, one on each side. These full color promotional signs can have replacement graphics. Simply order them and change out your header. The coverings are so useful that really they have a place in almost any public event. The runners can be used at local fairs or parades to show that your company supports the community. Schools can use them at graduations or open houses as a welcome to new students and parents. Trade shows are a given for the use of the tablecloth covers & skirts because vendor can’t be everywhere in their booth at the same time. Using a covering will make sure that customers know your business name. Of course, these overlays are used at restaurants and bars too. Bring in more passersby with the use of the coverings on your patio or porch so everyone sees how much fun your customers have! No matter how the runners and cloth overlays are used, they will get your company noticed!